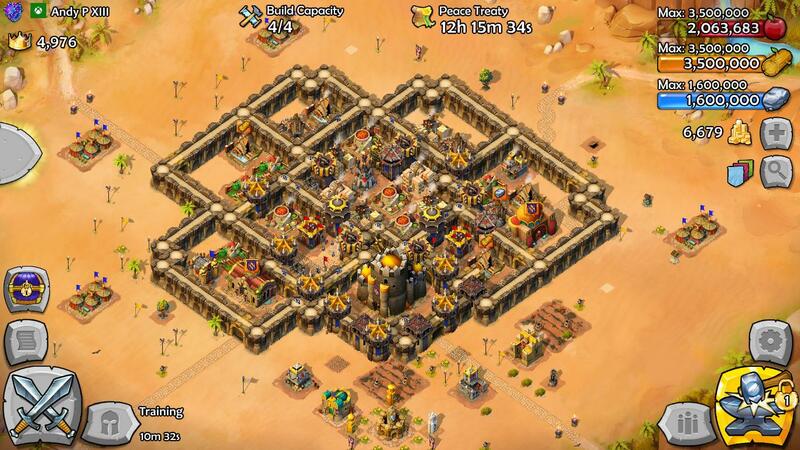 Welcome to Age of Empires: Castle Siege! Looking for ways to improve your gameplay? Not sure what certain terms mean? Check it out here! Players, if you would like to share your knowledge, post here! You will get the "Content Creator" title for contributing and sharing your knowledge with others. As we all know, certain issues and questions about the game tend to get brought up over and over again. To help, it makes some sense to attempt to concentrate our collective knowledge into a single thread. This has been tried before. Often those threads get derailed and mucked up. Here, the mods will use this opening post for an exhaustive FAQ. We are keeping the thread open for discussion, but are asking that you guys use that to submit additional content/edits to existing content. After we review those proposals, we will edit the original post and delete the proposals. That should allow this thread to remain very concentrated and organized. How does matchmaker work? Why am I being matched against people with way more crowns than me? The factors that contribute to who you get matched against are your “power level”, which is based on the upgrades you’ve purchased both for units and buildings, and the number of people close to your power level who are currently available to be attacked. Keep in mind that not all Age IV players are much weaker than those in Age V. An Age IV player that only has his keep left to upgrade and an Age V player who has only upgraded his keep are effectively the same power, and we account for this. In addition, the game presents a range of potential targets; enemy castles that are more or less powerful than you can be potential matchmaking targets. This gives players an opportunity to challenge themselves or to go after a weaker player. We scale potential resources with this as well: attacking a stronger player nets you more potential resources while attacking a weaker opponent means less potential resources to raid. Because making matches is highly dependent on the number of players available to match to, there will never be a system that is "balanced" all the time. The total pool of people who can be matched against is changing all the time so the way matchmaking feels, subjectively, changes as people enter and leave different levels. It also changes based on the number of people with peace treaties. Higher level players also tend to be more active and also get longer peace treaties. Ever person under a peace treaty is removed from the match pool so each player's pool of potential matches is fluctuating constantly. Since the launch of the game, we have never taken your crown count into consideration when matching you with opponents. However, as you climb the leaderboard, matchmaker starts to skew things toward people with similar crown counts. We keep you "logged in" for a few minutes after you log off, so that intermittent loss of internet connection due to bad cellular or wireless connections won't immediately open you up to attack. What are power levels? Where can I find out what mine is? 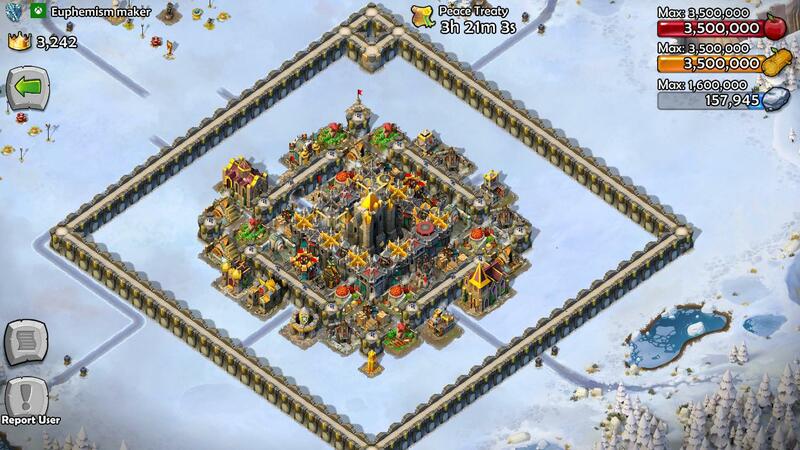 Your castle's power level is the sum of the power of its offense and defense. It does not correspond with your crowns, your castle's age nor your siege results. 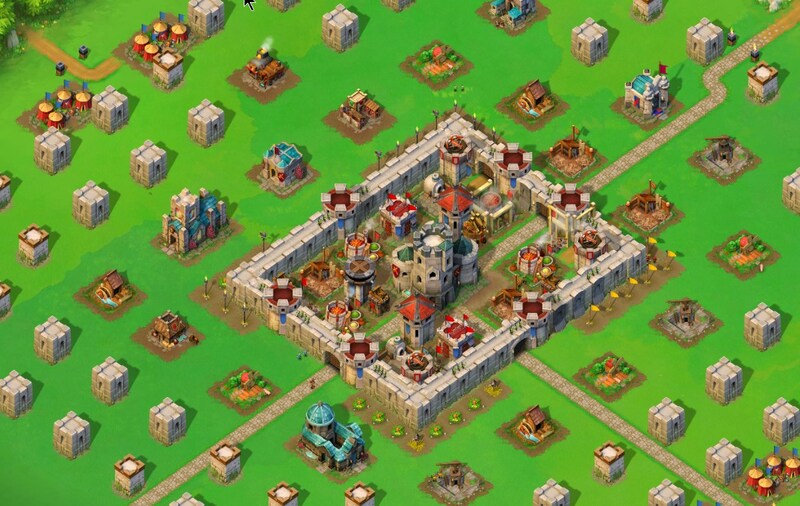 You can raise your power level by upgrading buildings, walls, defenses and troops. You cannot lower your power level. Each building you build/upgrade and each troop you upgrade irreversibly adds a little bit to your overall power level. We do not know how much each building/upgrade attributes to your power level. Example: If you smashed the castle of your enemy and got 1525 Food in the chest, his power level is 25. Why is my castle being attacked by someone 1, 2, or even more ages more than me? How do I overcome this? Again, matchmaking is based on the power level of your castle, not on the age of your castle. So it could well be that a highly upgraded Age 7 castle has the same power level as a barely upgraded Age 9 castle. If this starts happening to you, consider it time to age up. Because with every other upgrade to your castle in your current age, you risk only make it worse. If you do not like being matched against higher ages, then do not upgrade everything before you age up. Consider not upgrading troops and heroes that you do not use. There used to be a loophole where low age players (often done in Age 5) could stop upgrading and grind enough crowns to grow to such a number that they'd appear on the top 200 leaderboard. (One guy, Cavalry Cat , reached first place this way.) Due to the high player population in lower ages, it is very rare to get attacked. And because high age players could not attack low age players, those grinding low age players were essentially immune to ever losing crowns. To constrain this a new rule was introduced. Basically for each age there is an unknown crown cap, that once exceeded opens your castle up to attack from higher age players. The "Cleverly Cat Flag" you can buy as an honor item in game is also a reference to Cavalry Cat's clever strategy. Should you find yourself falling under the "Cav Cat rule," aging up your castle will get you rid of those high age bullies. I seem stuck at this number of crowns, I can't find more, what's happening? If you do a constant number of attacks per day, you'll gradually gain crowns at an increasingly slower pace, and after some time you'll reach what is known as a 'glass ceiling'. Your castle has a power level, and matchmaking is based on it. Because crown rewarding is based on a levelling system of diminishing returns, this means that each power level has a distribution of crowns. And as you gain more crowns and approach the top crown numbers for your power level, you'll find it increasingly hard to gain more crowns. To find more crowns, you must therefore either increase your attack frequency, or move up in power level (or both). You will directly find out that you've moved up a bracket in power level once you encounter castles (whether in defense or offense log) with such high numbers of crowns you never saw before. A way to assess your crown growing potential is perusing your defense log. As long as there are many players in there with many more crowns than you, you've still got headroom to grow crowns at your current power level. How is the amount of resources available to be looted determined? The amount of loot is decided by not only the amount you have in your storage, but also the amount you haven’t collected from your gathering structures. The chest loot is awarded mid-battle immediately upon destroying the keep. If for whatever reason you close the client or get disconnected before the post-battle rewards screen, you will still have received your loot, but not necessarily know what it is. How is the amount of pennants available to be looted determined? When you attack another player, a percentage of their entire stash of pennants--across all civs--is up for grabs. All pennants you take, however, will be converted into pennants specific to the defender's civilization after combat. For example, if a Saracen player has 100 pennants (20 Franc, 30 Briton, 50 Saracen), and they lose 10 pennants as a result of combat, then they will lose 2 Franc, 3 Briton, and 5 Saracen, all of which will be converted to Saracen pennants on the attacker’s side. If the numbers don’t divide evenly, the remainder is taken from the pool with the most pennants. This is why it looks like you're leaking pennants after you're attacked. This keeps you from hoarding pennants of other civs indefinitely, but still allows you to look for pennants specific to a certain civ to bolster your own stashes. Unfortunately, things look confusing in the Defense log, since the icon shown for resources lost is specific to your own civilization. This is giving the false impression that you're only supposed to be losing your own civ's pennants on defense. We're working to make this clearer in a future update. How do crowns work? Why do I lose more than I gain? To determine the number of crowns an attacker can take from a defender, the game uses the ratio of the number of crowns the defender has to the number of crowns the attacker has to choose a percentage. If the ratio is low (meaning the attacker has few crowns relative to the defender), then the percentage will be low. If the ratio is high, then the percentage is high. The number of crowns that the attacker can possibly take is equal to the number of crowns the defender has multiplied by this percentage. Note that the percentage is not equal to the ratio – there’s a lookup table, and higher ratio values return higher percentage values. This design rewards players for attacking other players that have a lot of crowns, and makes it less valuable to attack players that they have many more crowns than. The game uses a similar process to determine how many crowns the attacker will lose if he attacks the target and fails. It determines the ratio of crowns of the attacker and target and uses that ratio to choose a percentage of the attacker’s crowns that they will lose and the defender will gain if the attack fails. There’s a different lookup table here - attackers generally stand to lose a smaller percentage of crowns than they stand to gain. There is one additional step. If the number of crowns a player would win is less than 2 crowns, then they actually win 2 crowns minimum. If the target doesn’t have 2 crowns, then new crowns are generated. When a player has above a certain number of crowns in an age, this minimum begins to decrease, and eventually becomes 0. This is to prevent players in low ages from rising to the top of the leaderboard by repeatedly attacking weak targets for 2 crowns at a time. How are the total number of the defender's crowns that are offered to the attacker calculated? There are two ingredients: (1) the crowns the attacker had to begin the battle and (2) the crowns the defender had to begin the battle. 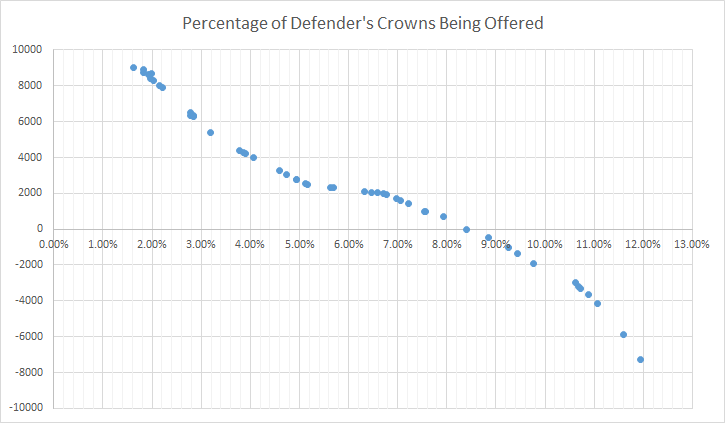 The difference between these two numbers determines the percentage of the defender's crowns that are offered to the attacker. For instance, if the attacker has 5k crowns and the defender had 1k crowns, then the difference is 4k. If the attacker has 1k crowns and the defender has 3k crowns, then the difference was -2k. The only exception is when the percentage would result in more than 1200 crowns offered. In those situations, the game simply caps the total crowns offered at 1200. This little table gives (approximately) how many crowns are offered for any plausible match-up. Again, this is not going to be perfectly accurate, but should be relatively close to the real thing. It is color coded kinda on the premise that anything below 100 crowns is lame and anything above 250 crowns is usually worth jumping on. However, it shows some interesting trends. For instance, it should put us all on the same page about grovelling about nexting. So where it takes a guy with 3k crowns a long time to, say, find someone offering 250 crowns (he needs to find another guy with 3k), in the same period of time, the best a guy with 8k crowns would find is someone offering 105 crowns. However, it isn't that the 8k guy is getting offered worse castles than he was when he was 3k. He is being offered the same castles. They are just worth far less to him. This is the glass ceiling. Similarly, let's pretend there is a guy with 3k crowns who gets thrown into matchmaker. He gets attacked in 5 minutes. Since the vast majority of players have far less than 3k, let's say he gets attacked by someone with 2k. In this situation, the defender with 3k offers 270 crowns. Now, a week later, if the same defender now has 8k crowns and gets thrown into matchmaker, he will likely still get attacked by someone with 2k crowns, too. This time, though, because of his whalish figure, he now offers that guy 928 crowns. The game is not treating him any better or worse this week. The same game that presented him with enough crowns to get to 8k is now exposing him to losing a larger chunk of those crowns. Also, I quickly made a chart for castles lower than 1000 crowns attacking each other. I believe that it is fairly accurate, but certainly is not exact. What is a time bucket? It works like an 8 hour hour-glass. While you’re online, the amount of time you have to be protected is decreasing. While you’re offline, the amount of time you have to be protected is increasing. You can’t have more than 8 hours total of protected time. 1. "You will be vulnerable to attacks soon..." Several minutes before you're actually vulnerable. 2. "You are now vulnerable to attacks..." You're now vulnerable. What's up with revenge battles? Presently, you cannot be revenged while you are in a peace treaty (or when you are online). The Devs made treaties revenge-proof to solve the problem of people having all of their resources pillaged as soon as they signed off due to getting hit by 10+ revenge attacks. The Devs have said that they changing the revenge rules is possible, "but it'll have to be something a bit more nuanced than just reverting to the old system." Players have the option to retry their own battles up to 3 times. Players can post a retry battle every 24 hours to their Alliance, which allows one alliance member to play. If in the original battle the attacker did not use all of its troops, only those troops used are available in the retry. However, all heroes available in the original battle are available in the retry, even if they were not used originally. Players will not get to keep any loot or earn any crowns from retry battles. Retry Battles do not count towards any Wonders and Achievement objectives. Cite. Everyone gets one Smashdown Battle per week. For the first battle of the day, players get matched against a lower level inactive castle filled with loot. Neither castle wins or loses crowns from Smashdown Battles. 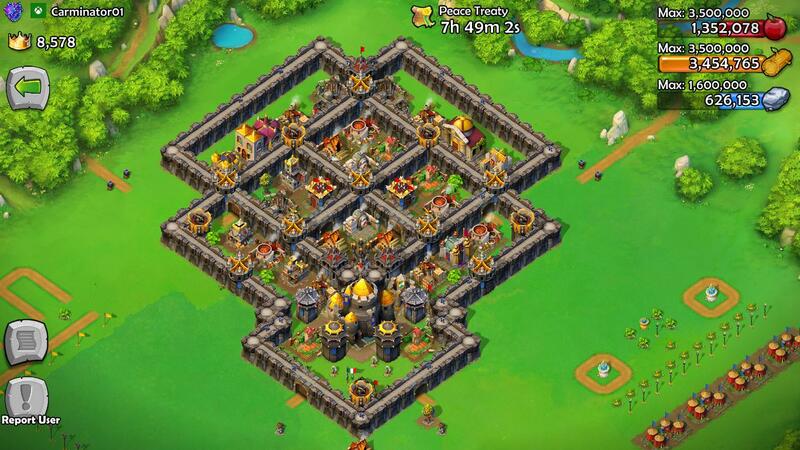 The attacking castle can Next to be presented with additional Smashdown Battle castles without spending any apples. 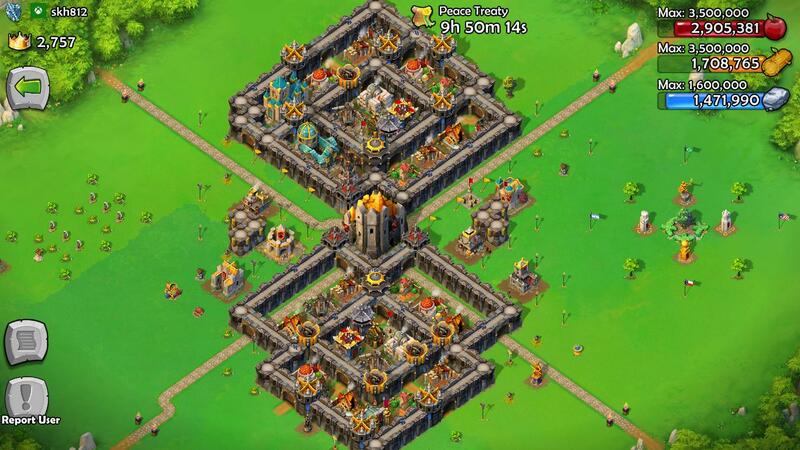 All Smashdown Castles offer the same amount of resources for each age level of the attacker, but differ in the kinds and amounts of pennants they offer. Note: some of the Smashdown zombies are still in alliances (look for an alliance shield on their Embassy to tell if they are) and may have relief troops in their Watch Signal. Smashdown Battles occur for one battle every Wednesday (starting from 6AM UTC). Cite. It remains available for 24 hours from that time. When it is time, a banner pops up in build mode similar to the Daily Combat Reward. Waiving the white flag without beginning the battle (such as by dropping a unit, using the decoy, or letting the scouting time run out) merely places one out of matchmaker, but will not remove the attacker from being in Smashdown Battle mode. There is no way to opt out of the Smashdown Battle (other than to either begin the battle and then resign or not battle during the full 24 hour Smashdown period). No matter what, a castle can fight only one Smashdown Battle each week; it ends after one battle. Smashdown Battles affect alliance stats and wonder objectives. Some have observed, but we are not yet certain, that the resources rewarded to an attacker spawn from thin air rather than being taken directly from the zombie castle. Searching for a Smashdown Battle breaks an attacking castle's peace treaty, which is analogous to traditionally entering matchmaker. Similarly, any troops or heroes used in a Smashdown Battle must be regenerated before use in another battle. Combat Hour is a weekly bonus in which an attacking castle receives additional resources after every battle fought during that time period. Combat Hour starts when a player first logs in every Friday and lasts for the next two hours. Every 24 hours, each castle is given nine battle chests. To earn the contents of each chest, players must obtain a key. Players can win up to two keys per battle -- the first key is awarded at 20% destruction of the empire and the second key is awarded at 60%. The battle chests will reset every 24 hours. Each 24 hour period players can earn keys and open up to 9 battle chests. There are 4 tiers of chests: Bronze, Silver, Gold and Royal- the higher the tier, the better the reward. Silver: Two gifts of any combo of either Regular Stuff or 30 gold. Gold: Three gifts of any combo of either Regular Stuff, gold, or an honor item. Royal: Four gifts of any combo of either Regular Stuff, 99 gold, or an honor item. The drop rate of each type of battle chest: We are guaranteed at least 2 silver chests and 1 gold chest each day. Of the remaining 6 chests, it appears that about 77 percent will be Bronze, 20 percent will be Silver, 2 percent will be Gold, and 1 percent will be Royal. These are our best estimates, so chill out. Defending units, in general, are slightly faster than the attacking units, even if their levels are the same. The Devs wanted to make sure that the defending units are able to catch up to the attacking units, and avoid incoming projectiles as much as possible. What are zombie castles and how do they work? What is kiting, and how does it work? Players "take your troops for a run" so they don't interfere with the main siege. The most used troop for kiting is the champion troop, because they're quite fast and strong. So kiting becomes incredibly useful (forget about your troops participating at all) when you have troops in your GHs and PPs that are as fast or slower as the kiting troop- simply because they'll never reach them. 1) Make it all super slow troops [Teutonic Knights (TKs), Cheirosiphons, Longbowmen (LBs)]: by experience after watching many replays, I can ascertain most people just half-assed-ly kite and are very impatient- they won't wait too long for the troops before starting the siege. In other words, you have good chances that your slow troops will turn back to the main siege in time. Note: this does not apply for patient people, and depending on the troops you place it can turn out quite useless. Frankly, I don't recommend this. 2) Make it all super quick troops (cavalry in general, esp. mamluks, but also bowmen- NOT KNIGHT TEMPLARS: they're slow as F.): this option will make kiting pretty pointless, as mamluks will kill off the kiting troop in no time, so that's a plus for you. You can also have only Raiders of Muscovy- these will seek out siege weapons, so will stop the enemy's kiting after the first round (except if the player keeps spawning kiting troops ON the RoMs in order to engage them so they don't run off towards the siege weapons). However, cavalry is not very powerful and can be repelled easily by the main attack, because, except for mamluks, they are melee. Another problem are these annoying players who kill off your troops, but leave only 1 horse so the GH/WS doesn't spawn any more troops. But worry not, there aren't many (actually, they scarce) who can do this effectively. 3) Make a mix of quick, intermediate and slow troops: this is usually the best option. 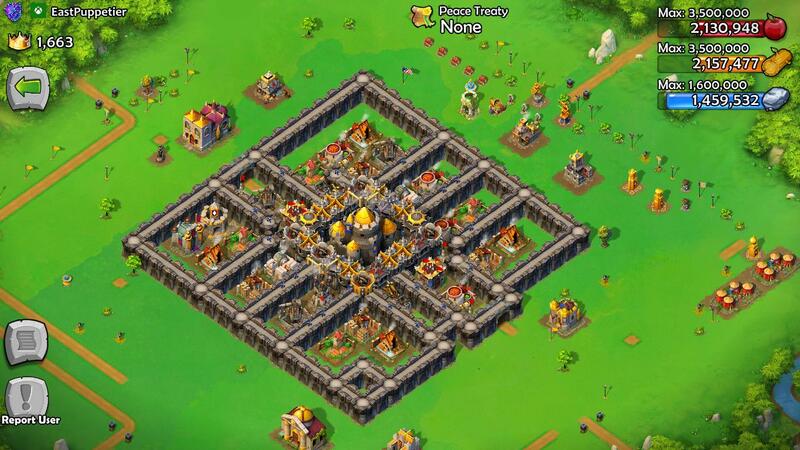 Have slow, powerful troops to help in defense, and have fast troops kill off the kiting troops. Usually grens in one GH and RoMs/mams in the other work pretty good. 4) Have your troops on standby (defense position) so they only attack when enemy troops come near: only do so for your PPs. Don't do it with the GHs. Just don't, because it's stupid. Take that from me. 5) The Watch Signal (WS): this is probably the best way to fend off the attacker's annoying kiting (along with the others). No matter how good the kite-er, when it's more than 3-4 troops, kiting is useless, needless to say why. 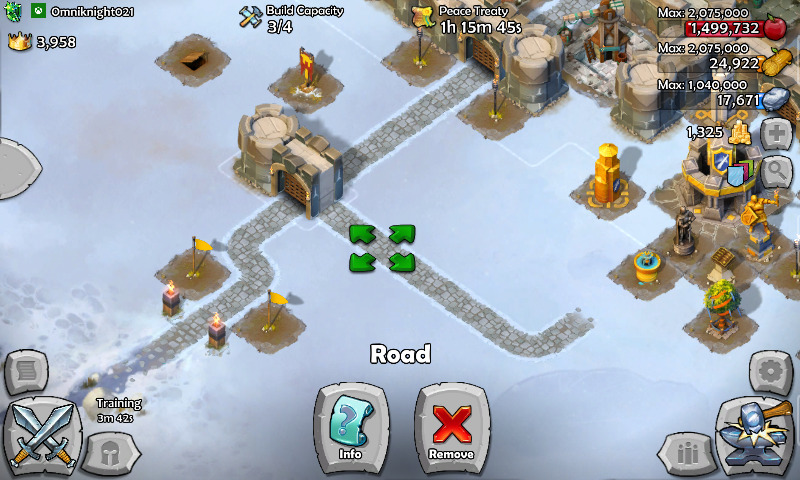 Please note that there are many players who don't waste time kiting, and simply kill off all your troops as they come. There are also 2 heroes that'll convert/make run in horror all of your troops, and as Conram-Joan and the yellow-Beli'ed-John rushes become more popular with the day, your defending troops will be laughed at. So none of what I said above applies to these. 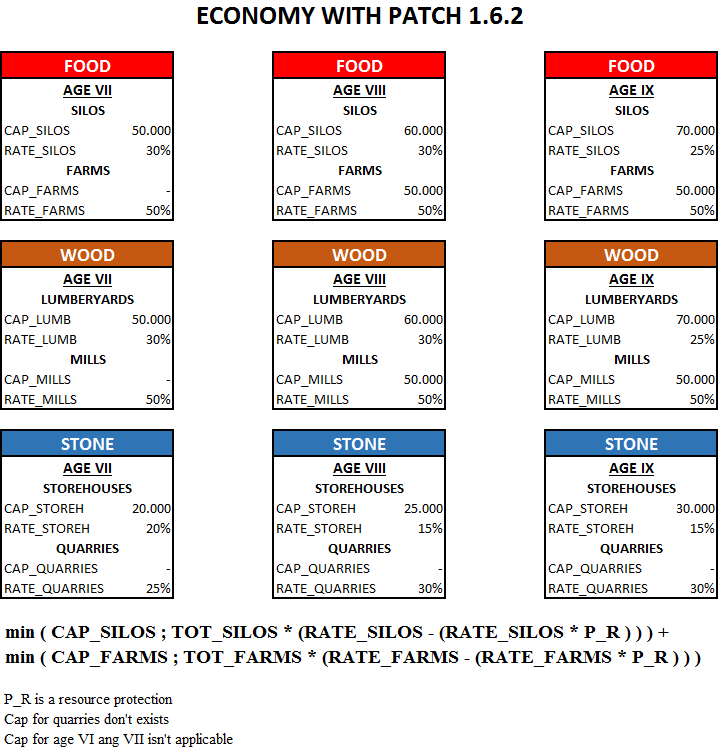 How is damage for units calculated and dealt? Damage is dealt to individual units of the squad. Damage is per hit, not per second. Each squad type has an attack rate that determines how often they deal damage. However, the damage dealt from a unit is expressed in terms of damage per second per solder (not per squad). So if you want to figure out how much damage your squad does, you would multiply DPS by the # of soldiers per squad. How do bonuses against certain units or structures work? Bonuses act as multipliers, but the exact numbers are not published. To complicate things further, the Developers are pretty sloppy with stating each and every unit or structure that is subject to a bonus. For instance, the ingame statistics of Grenadiers state that Towers and Siege Weapons are its "Preferred Target." However, the Developers have stated in the blog that Grenadiers have a bonus against Siege Weapons, Towers, Cavalry, and the Keep. Short of isolating instances of every unit or tower attacking every unit or tower, we can't say for certain who has a bonus against what (or of how much). 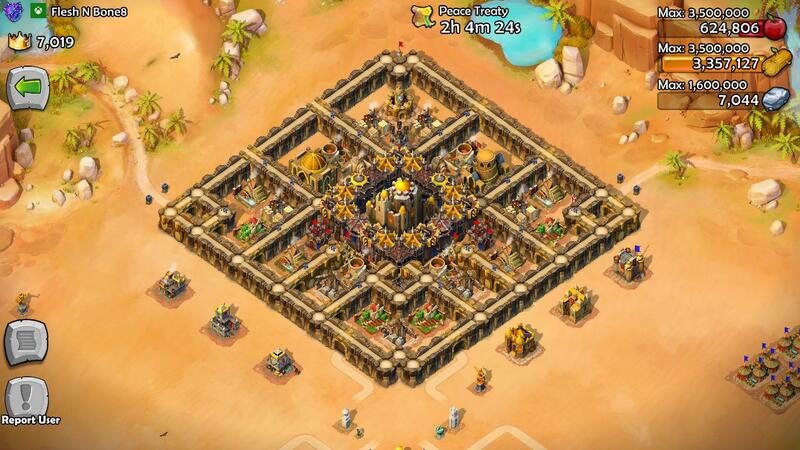 Knights Templar: Large bonus against Towers and Walls. Small bonus against the Keep that makes them less effective than both Grenadiers and Cheiros. Grenadiers: Bonus against Siege Weapons, Towers, Cavalry, and the Keep. Their bonus against the Keep makes them more effective than Knights Templar but less effective than Cheiros. Their bonus to Towers is large. Their bonus to Siege Weapons is somewhere between a multiplier of 4 and 5.99. Cheirosiphons: Bonus against the Keep that makes them more effective than both Grenadiers and Knights Templar. Is the health stat for each unit or the whole squad? The health stat shown is for each unit of the squad, not the squad as a whole. 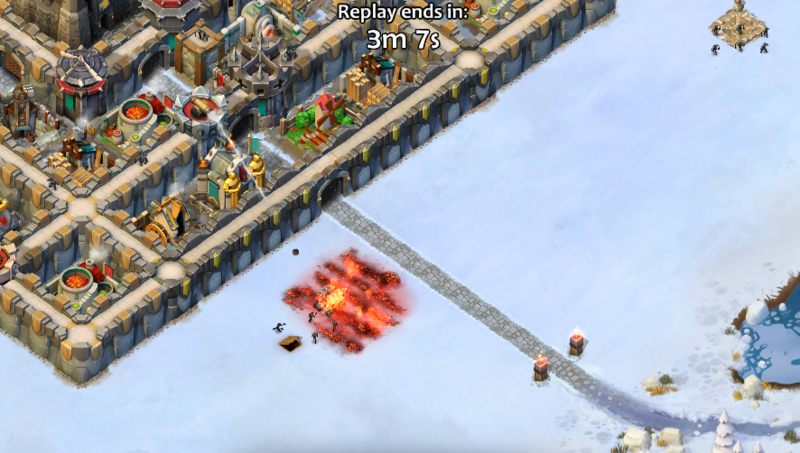 Why is it that Laddermen have a need to go over a wall even if there is clearly a gap of completely destroyed walls into the enemy base? When choosing a path, units calculate what takes the shortest amount of time. In the calculation for laddermen traversal time we have a factor for how long it takes to set up the ladder and climb over the wall. The other factor is that units have a limited sight distance so sometimes the breach isn’t visible to them so isn’t consider as a viable path. Is there like a video that shows me how to use all the heroes? Conrad's ability is only available when Conrad is in the Tower. Once he leaves, there is no ability. He only ever has one use of the ability. Level 1 = Short duration and lower dmg resistance"
Level 2 = Improved duration, but still short and lower damage resistance 60-70% I think? Note: Winrich can destroy a maxed musket tower. His damage bonus doesn't apply for watch signal because it is more an emplacement than a tower..
Use Maslama's ability not on towers but on your attacking units. 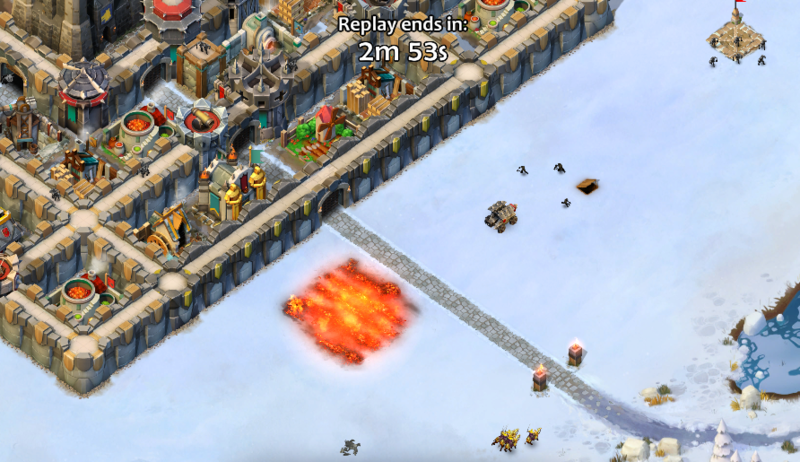 His ability protects your surrounding attacking units (that are within the smoke) from tower damage (including Flame Towers). It may look like the towers are still hitting your smoke-covered units, but they will not be taking any damage from it. However, your units are not protected from defending melee units + Cheirosiphons. On the other hand, your units are protected from ranged units; his ability protects you from all ranged attacks (this includes Catapults). Here is a screenshot to illustrate his ability better. NOTE: This illustration is old and Maslama now protects units in his smoke field from flame, such as from flame towers. So Please disreagard the "Aieeee! We're on fire!!" bit. What do Knight Templars do? Knight Templars get a bonus damage to towers. They are like crossbowman in that they are designed to take out defenses. How do towers work and what is the best way to drop them? 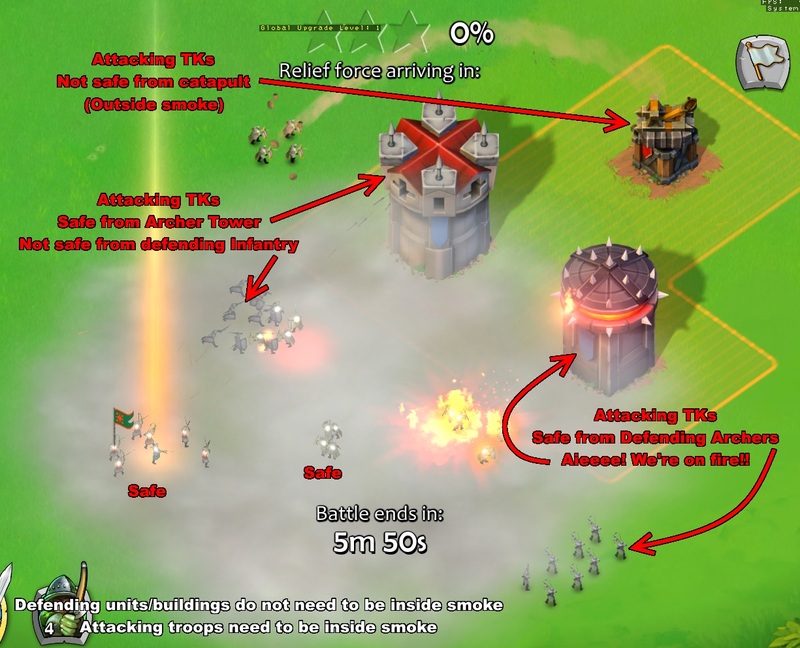 Archer towers and cannon towers work the same way. If the attacking unit is closer than the distracting unit, then it will switch to the attacking unit. 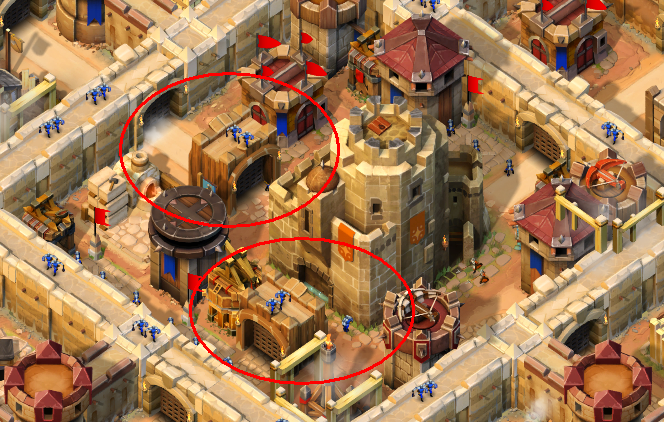 If two units are attacking the same tower, then it will switch to the nearest target. 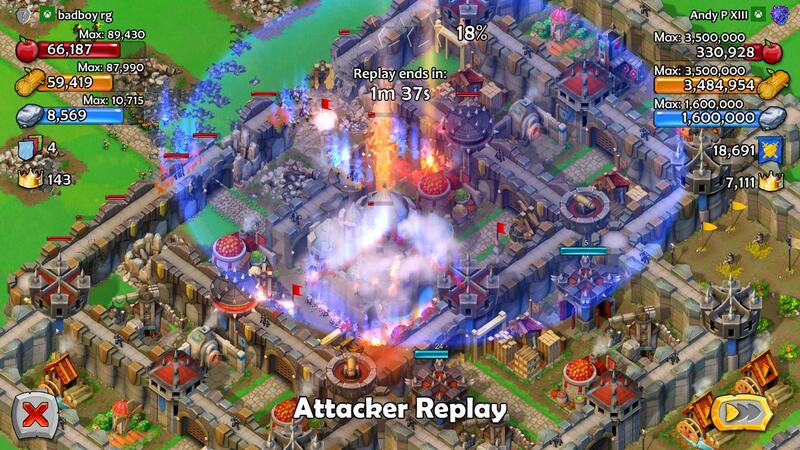 In general: While initiating the attack, It's always better to use trebs+ meatshields to take down towers. Archer Towers: The best distracting unit is champions. 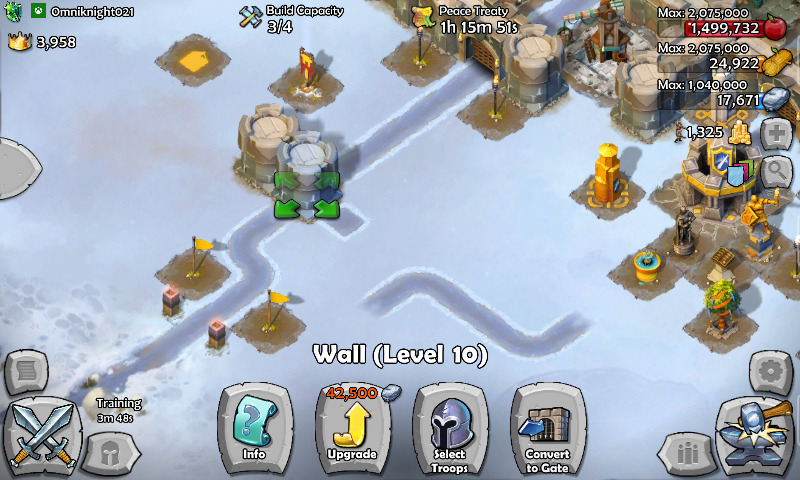 Grenadiers can be used on archer towers. 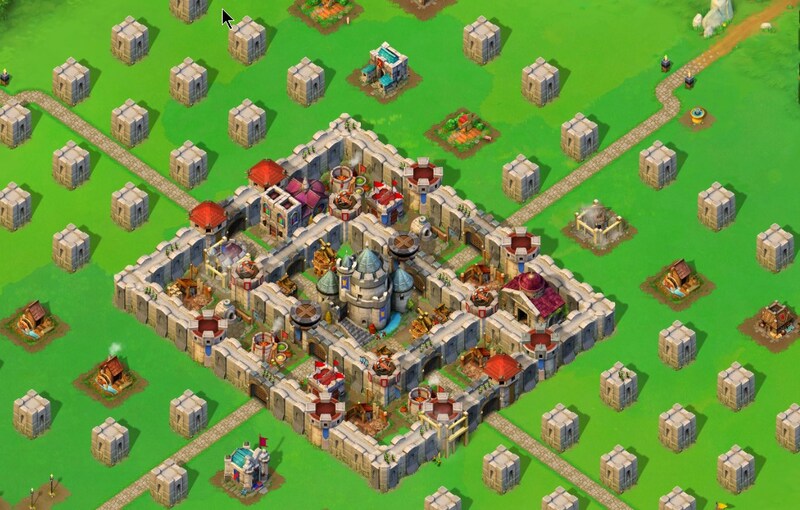 Some layouts have archer towers well spread out and placed on outer walls. In this case, you can't expect your trebs to roam around the castle.It is much time consuming. A squad of grenadier and a champion will do this. Knight templars can also be used. Also you can use them on towers at the end of the battle to take out some more towers. (For example, after martel's taunt). 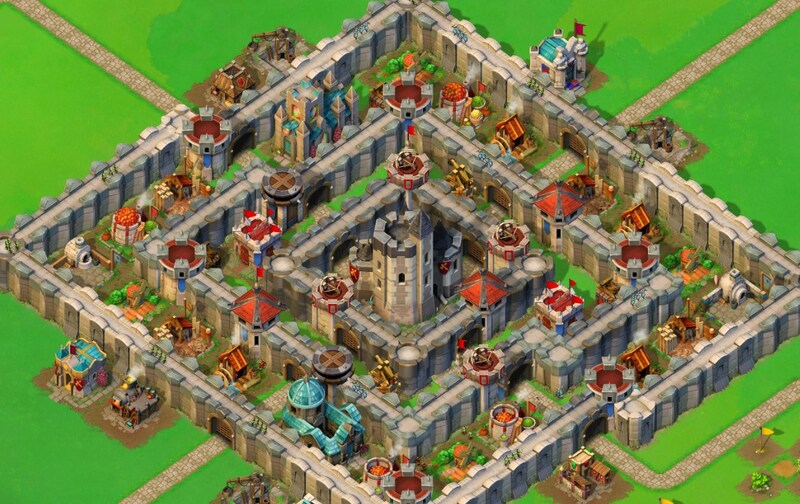 Cannon Towers: The best distracting unit is archers (since they are spread out). If you use champions against cannons, it is better to use them on resource buildings or on opened wall piece. If you use it on a closed wall piece, the cannon splash damage will take half of the squad. 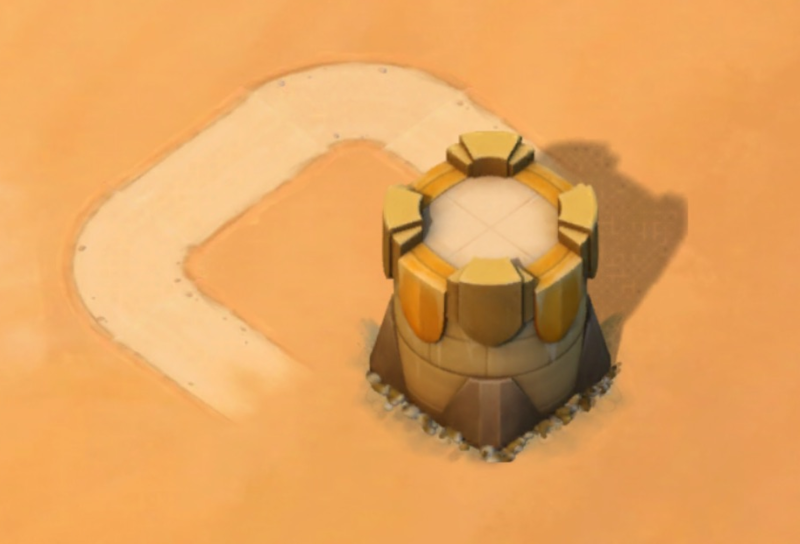 However, Cannon Towers are inaccurate, so if you move the units here and there, mostly it will miss the target. Pro Tip: If the cannon switched its target on your trebs unexpectedly, quickly redirect an archer to fire cannon so that it switches the target over that archers. For this purpose, many players use a mix of archers+champions as meat shields. Finally, if you have to take the last cannon tower and if you have no trebs to deal with it, you can distract them with some units and direct a grenadier inside the short range. Musket Towers: These are very dangerous because they have huge range, health, reload speed, and damage per second. Though they do not have any splash damage, they never miss the target (even mamluks) and it takes forever for the trebs to reach them. It shouldn't be a problem with Martel, Conrad and infantry rush attacks. But it's a bit tough with other heroes. Use units with higher number of soldiers as distractors (champs, archers and pikeman). Knight Templars also work if the cannon tower is not within its range. Emplacements: These are tricky. They switch targets frequently. If it is just behind the wall, then use archer/ trebs. If the wall is breached, use two squad of mamluk. Laddermen can work, too. What it is: Conrad, at least 6 rams, usually 10+ rams. Often paired with Joan on the theory that if Joan converts other troops, then you can fit even more rams into your suitcase. This approach uses tons and tons of rams, and focuses them each on different towers and emplacements, using Joan to convert troops to clean up. This seems to be the most popular approach. This is Conrad + Rams + no effort. This renders the most formidable defense worthless. Anyone have a good video? Some suggest there is a second Conram theory in which the army has a mix of rams and other troops. This approach strictly goes to knock out the keep and uses the 60+ troops and second hero to cross the 50% second star line. Martel covers the rest of everyone. This renders the most formidable defense worthless. What it is: It is Richard, Herman, and 72 of your favorite infantry. Some guys use a few trebs, but just a sprinkle. Don't let them overwhelm the recipe. Basically a locust farm in digital form. When used correctly, this renders the most formidable defense worthless. This has many variations, but basically Beli breaks a few walls and then a mess of Meatshields and KTs provide cover for Edward to strike the keep 3x. This renders the most formidable defense worthless. You can pair him with Herman, with Maslama, and perhaps with Richard. Take at least 10 red raiders. The rest of the army is negotiable. Find a castle with no more than two walls between you and the keep. No nearby flame towers, please. Blast a hole and soak the place with infantry. Get in and get out for one star, maybe two. This involves dozens and dozens of green archers. Someone needs to write a better description, please. One Archergeddon uses Joan and either Maslama or Hermann. It's usually a 2-star attack, but vulnerable if Maslama dies early. Take about 7 Grens to punch a wall holes to the Keep for Archers, and Maslama to cover the Grens. Joan converts the Watch Signal trops and uses them to destroy the outlying buildings and/or provide cover for Grens. Use Richard+Belisarius and shoot for two stars. Take about 35+ Archers, 20+ Raiders, 6 Champs, and 4 Mamluks. Use Mamluks to kite defensive troops. Meanwhile, use Belisarius to open a path to the Keep for the Red Raiders. Continue to,break down walls to open sections for Raiders, and destroy outlying buildings. There are 153 possible hero combos, and if we talk enough, someone is going to insist that this FAQ includes every single one. But here are some of the more popular ones. A higher difficulty level attack but can be devastating in the right hands. Was used more often in age 9 than age 10 which is gonna be a theme . A one-time popular age 8/9 attack in a time before you had to worry about Saladin freezing against turtles in age 10. Maslama hid the path as Saladin made his way to the keep to knock out. 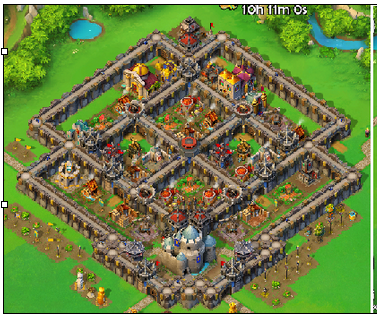 is a great pick in age 8 and below where you could effectively neuter a castle's towers with Winrich and using your troops as well as the enemy defenders to clean up the rest. Added troops of age 9/10 as well as the increased rate of guard house deployments have made this a relic of those ages and replaced by Joan and Saladin combined with archergeddon to just go for a 50% one star copout. This was a popular pre-Martel buff attack. So it's pretty ancient now. But for posterity: It was an incredibly effective attack especially against age 8s and below and those with weaker walls that essentially just melted away enemy defenses and walls out of their path. Its effectiveness was extremely diminished against age 9 and even more against age 10 keeps. 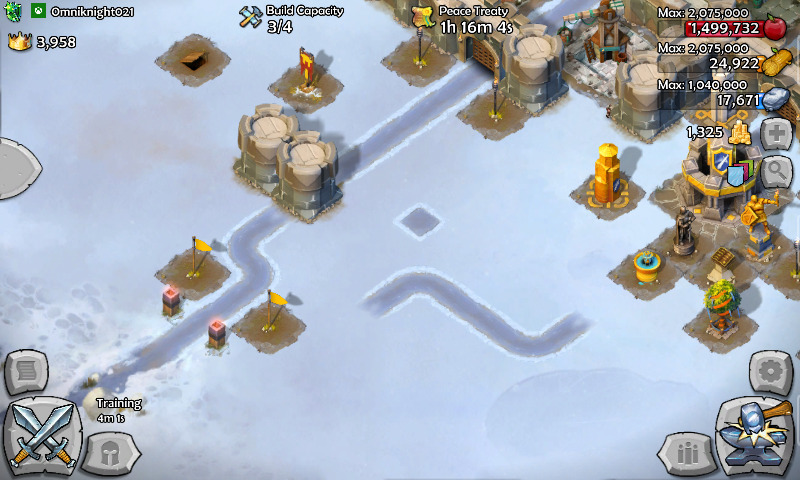 Again, there are infinite defenses, and nobody is served by people simply finding some unique looking castle and giving it a funny name. But here are some of the most common ones we see. Some of these are photocopied pixel-by-pixel by players. Others people borrowed thematically and riffed on them how they see fit. Regardless, some patterns emerge and there are some general strategies that work against each of them. That's important teaching material. 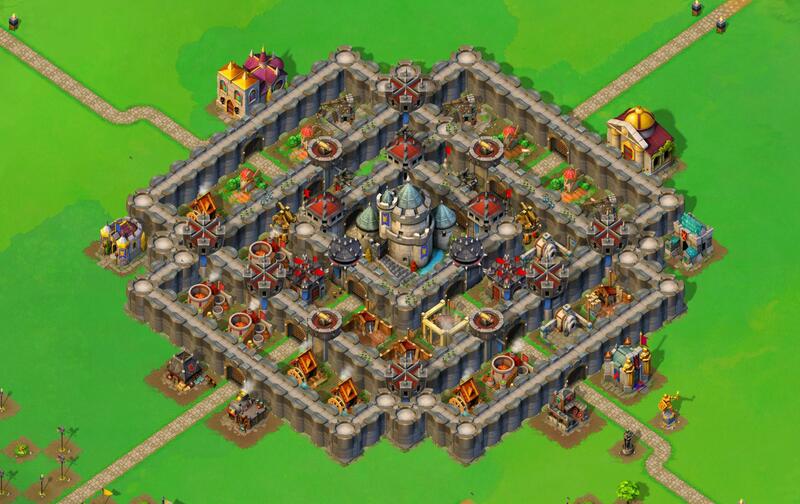 What it is: Age X castles have 20 towers, which is the magical number needed to completely surround the 4x4 Keep. Though this formation gives up the ability to collect daily gold via your roads, it totally prevents Conrad ram rushes from reaching your keep and creates a super dangerous kill box. I've seen some Turtles with defensive logs of fewer than 40 stars. I believe this formation is presently the strongest one around. How to beat it: A well-placed Winrich is brutal. Also Herman and Richard, as shown in the Rainbow Rush strategy above. What it is: Ever since the Devs nerfed our ability to revenge our opponents while they are in a peace treaty, the most effective way to defend your crowns and resources has been to simply give up one star and hope nobody gets greedy. The Devs have never addressed this giant bit of nonsense they created back in the summer of 2015. However, tributes seem rarer ever since the Age X came and made the Turtle possible. 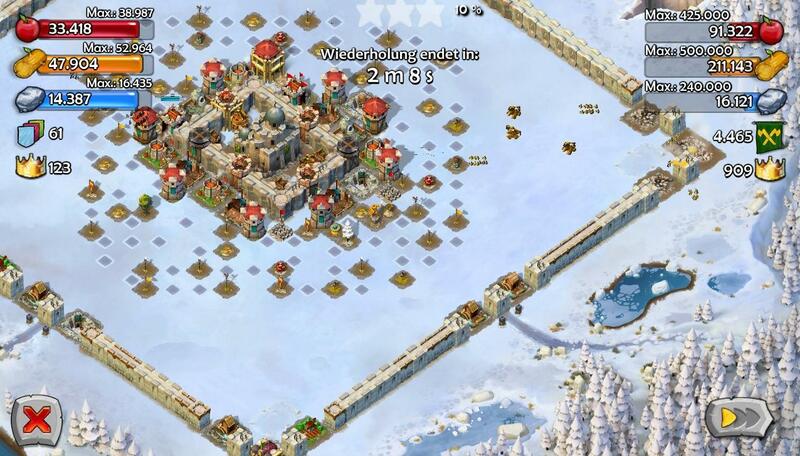 How to beat it: Usually, it's best to use as few troops as possible, take the Keep, and get out of town. In a vacuum, one teutonic knight will drop the Keep. However, lots of chuckleheads like to dangle that free keep while loading the area around it with traps and towers. There is some good strategy in that, as the more units you can make your attacker waste, the less of a chance they try to steal a second star. If the castle isn't very well defended (or even if it is but its loaded with crowns), it is often worth dropping your army on a full scale attack. Some people like to get tangled up in their own various permutations of ethics and sportsmanship. Feel free to make your own decisions. No matter what, though, don't be like this guy and leave that Watch Signal outside the walls. That is just stupid. More people also seem to prefer the semi-tribute to its naked cousin. 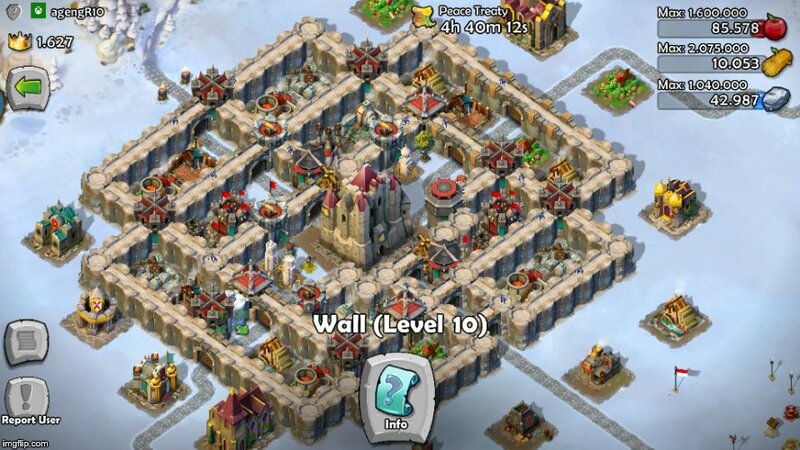 The Semi Tribute is where you drop your keep behind one set of walls and make the attacker really spend some troops to get that first star. That leads us to the most famous Semi Tribute, the Turkey. What it is: This is a castle built either in the top or bottom corner. The Keep is on the outside corner and is guarded heavily, usually with Archer and Flame/Crossbow Towers with Catapult Emplacements tucked in behind them. It has a nasty, ugly face, an unguarded rear, and two pretty useless wings. Plus it has a very juicy center. And for a while, it used to strut around the leaderboard like it owns the joint. 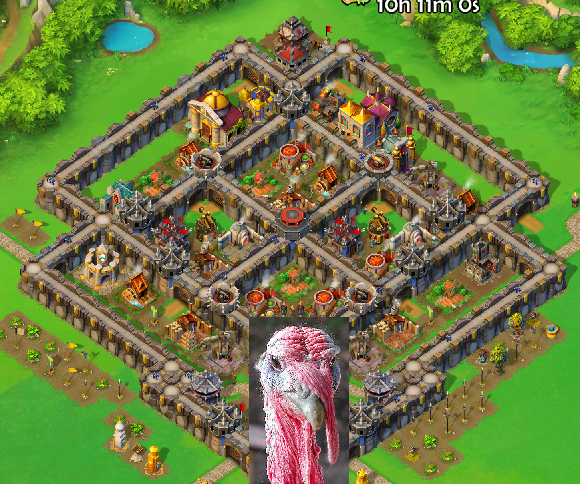 How to beat it: Use as few trebs and troops as you can to cut the turkey's ugly head off. Then drop the rest of your army at its tail and pluck it's feathers, moving your way to the center. This is my version of the turkey. It's even uglier. Also essentially a semi-tribute. Very juicy center. It is intentionally hard to look at. It's a game of seconds, and symmetric layouts cut the scouting time in half. You gotta stare at every side of my castle to figure out where things are. I hate this one. I have never been able to get both sides of it. Anyone have some intelligent thoughts for the kids at home? I sure don't. Teachable moment: Hey, what are those little 3x3 wall squares some of those castles have? If unattended, trebuchets and rams will naturally seek out sealed sections of walls. These dumb little squares serve as decoys, drawing trebuchets and rams to completely forget about attacking stuff that matters and crawl all the way across the screen to seek out and destroy these squares. It's insane. If you see any, drop a grenadier or a ram down to poke a hole in it. All it takes is one hole to clear your siege weapons' heads. This is a classic defense that has been with us since launch. It's a mess of intersecting walls that create very small pockets to hide the high percentage buildings. Note the open 3x3 spaces to directly adjacent to the Keep. Those are fire traps. Named for the isreali 'Iron Dome' missile defence system... The 'TERRORDOME' advanced anti-Conrad defence system is now available and it's FREE!! get yours TODAY!! What it was: Individual wall pieces used to give off no spawn zones in each direction. So you could litter your field with them to force people to spawn at the edge of the map, which really screwed up timing and caused delays. It got to the point quickly where every top castle was a frost. Why the weird name? With credit to @spirits back when the game was just two months old: Both Napoleon Bonaparte and Adolf thought they could invade Russia during their conquests only to hit the harsh plains and be cut off of any reinforcement and supplies. Similarly this defense really relies on using the huge area of the map and allowing the enemy troops to dwell in, and cut them off support the further they go in. The idea is to space out building and walls so as to force the enemy into spawning units away from the center and the keep. First the strongest units, the trebuchets will take forever to get there, and their meat shields the heavy infantry cannot be spawned on demand to protect them come the harsh winter. Two variations i have seen are one with a double wall, and a double outer spacing. Here's the original description by @spirits again, back in November, 2014: "Believe it or not, this formation has a great https://www.youtube.com/watch?v=hYQQe63x-ko. It stems in the ancient byzantine empire and has helped its capital, Constantinople, survive many raids. Basically your castle is in the middle surrounded by three layers of wall. The inner inter-wall space is 1 square wide and contains defensive emplacements, and the second inter-wall is two squares wide and has the rest of the buildings, in addition to buildings outside." Some variations have long range towers toward the inside, others the other way around, and some a combination of both. What it was: Back in the old days, buildings could act as walls for purposes of creating no-spawn zones. How do alliances work? What are their benefits? Everyone is a noble when they join an alliance. Nobles have no special perks (other than chatting). Lords can invite other players to join the alliance. Lords can kick nobles. Lords can make and delete announcements. Every alliance has one Emperor. The Emperor can do everything nobles and lords can do, plus the following: Promote nobles to lords, demote lords to nobles, and promote a lord to be the new emperor; edit the alliance name, shield, description, and settings; choose which wonder boost to research. You must be in an alliance to use your watch signal. Only members of your alliance can donate troops. Also, you must be in an alliance to activate wonder boosts or to contribute to the research of additional wonders/wonder boosts. Help! My emperor is inactive. How can we get a new one promoted? The Devs recommend that you first establish a unanimous agreement on the new Emperor. Holding a vote prior to sending them a message is preferred. Help! Some lord just kicked everyone out. What's the deal? Is there any generally accepted advice about wonders? What happens to wonder boosts when someone leaves? Who owns a wonder? Can my Emp just kick everyone out? The wonders and boosts belong to the alliance itself. So long as the Emperor remains the Emperor, the Emperor effectively owns the wonders. Unfortunately, an Emperor can kick somebody off an alliance even if the member contributed to the wonders. If the Emperor were to kick all members and then leave the alliance themself, the alliance would disappear along with the Wonders. How do watch signals work? Each league season lasts two weeks. The second that one season ends, the next season begins. Each season, upon finishing your first offensive attack, you are automatically sorted into an individual league based on the total number of crowns you have after that match. Similarly, each season, upon the first person in your alliance to finish an offensive attack, your alliance is automatically sorted into an alliance league based on the total number of crowns your alliance has after that match. Where there are more than 25 alliances or 100 individuals qualifying for a league, the leagues are randomly sorted into pools of those sizes. The objective of leagues is to finish the season with the most total crowns of anyone else in your pool. Once a player or alliance has been sorted into a league, they will remain in that league for the whole season, even if their crown totals grow (or shrink) beyond the parameters of that league. Note: In order for a player's crowns to count in their alliance's league and for that player to be eligible to receive any prizes that season, that player must be in an alliance before the season begins and must remain in that alliance without leaving throughout the entire season. The crowns of a player who joins an alliance after a season has started do not count toward that alliance's total crowns that season. If your alliance finishes in the Top 3 in its league pool, then each player whose crowns counted as part of the win will get the loot listed below. In the individual leagues, each player in the top 3 of their pool will get the loot listed. A player can win both an alliance loot prize and an individual player loot prize. Why are there so many high age players in my low ranked league? Because players are sorted into leagues based on the total number of crowns that player has after their first offensive match, many high powered players artificially reduce their crowns in order to qualify for lower ranking leagues on the expectation that they will be able to then skyrocket their crowns and win that league. Is there any time between each season? No. The very instant one season ends, the next season begins. Should we expect any changes to leagues? MS dariakus has said: "I wouldn't expect to hear anything until after the third season. It's tempting to want to knee-jerk and attack immediate issues but we want to have a few seasons under our belts to make sure any changes we make address any broader scale problems that arise." If you catch a spy, you receive up to 6 gold. We don't know if there is a daily limit to the number of spies one can catch, but some players claim to have caught as many as four in one day. Where did my missing road go? How do you make a gate with just one road piece? Set up 3 walls and 1 road tile. Then put the keep on the other side of the wall and you get the gate. Afterwards you can move the keep and the gate stays (as long as you don't change anything of the 4 involved tiles). 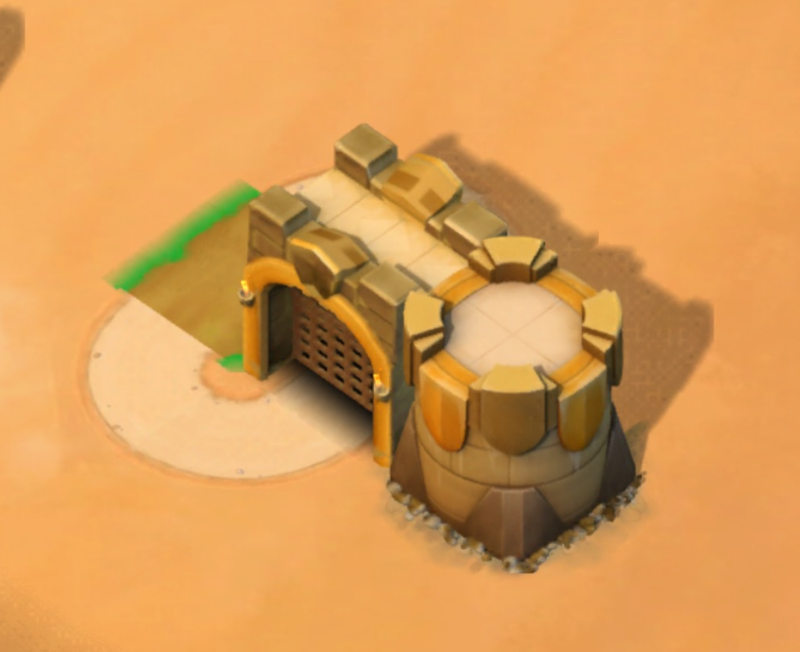 There is another hidden feature: You can have a single wall piece as a gate if it's directly placed at the keep. It's nice for some wall gren protection. 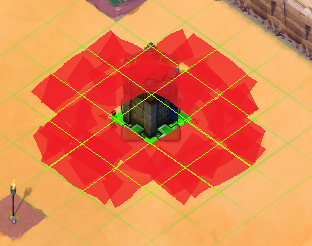 It feels like a feature, because the wall changes by itself if you place it between the keep and a road tile. How do you make three roads connect to one gate piece? Do you know any other useless tricks with walls and roads? Now, where the middle _ is (second row, second column), put a wall. This will turn into a gate, and one of the roads will turn into a 3-road intersection with green scenery. How often are patches released? What is the process that patches go through before release? After a patch has been developed, it goes to through a review process to be certified for release. Once the title has cleared Windows and Apple store review, we schedule them to be published at a specific time. In this case, 9AM Pacific. At that point, everything is out of our hands. Sometimes the update shows up within a few minutes, sometimes it shows up within a few hours. Sometimes Windows 10 is out before all the rest, sometimes the iOS build beats everyone out the gate. And even then, different regions can see the update in the store at different times. In the past, the server would only support one version of a client meaning that on patch day, nobody could play until they had the newest version. We modified that back in the spring to allow people to continue playing on older builds for a while to accommodate for these sorts of propagation delays. Should we expect buildings like markets which will allow trading among allies? Perhaps a new feature for gifting of items among allies? No. MS dariakus has said: "This is an idea that’s come up a lot, both internally and externally. Allowing players to straight up trade resources has a significant impact on the game economy, and not something we’re ever likely to do." Can we expect Alliance Wars? More Civilizations? But let's start with the most recent hints, obtuse as they are. At the launch of Age X, upon someone expressing surprise to see that the Keep can hold additional pennants, Phasma stated, "Yes we did increase the max amount in the Keep...... at this time there isn't anything new to buy, but it may come in handy in the future. ."
That day, she also stated in relevant part, "Focus on the new update for now. We are still at work on new things, but when these come and what they are get announced once they have been developed and shown as working in the game. Please stop asking." Working backwards, in early 2016 when dariakus was working on AoE, he said: I'd like to take a moment to stress that we have not announced that either Age X or Alliance Wars are coming to Castle Siege. They are absolutely things on our mind--I don't think it's divulging state secrets to say we've discussed adding another Age or bringing the most-requested feature of all time to the game. When we have something concrete to discuss about future plans, especially anything around Alliance Wars, trust me--you'll hear about it from us We are absolutely dedicated to the game and the Age franchise [...], and Castle Siege still has a lot of life left in it." "So here's a roadmap. Please do not take it as hardened truth or as a promise of future features--the farther out in the future it goes, the less reliable. But this is where our headspace is at. Hope it's useful. I'm going to be purposefully vague on some of the Long Term™ features because they're not confirmed, and definitely not fully designed yet. Short term (2-4 weeks): Tweaking/fixing treaties and crowns. More flags. A much-requested alliance feature (requesting troops). Mid term (2-3 months): More robust alliance searching and finding functionality, Leagues, and a smorgasboard of quality of life upgrades. More on what those are in the new year. Long term (3+ months): Alliance wars, Age X, Exploration, New heroes and cultural units (perhaps from civilizations presently not in game), and more..."
What happens if I change my civilization? You won't lose any of your progress by changing civs. Your civ-specific buildings will simply switch over to your new civ's type. It does, however, cost 500 gold. How can I change my gamertag? To change the name given to you for this game, you must log in to Xboxlive, and edit your gamertag. They allow you to change your gamertag once for free. The name you choose for your gamertag will be the name that shows up in the castle siege game. Is it legal for players have multiple accounts? How can I? It is legal. (But having multiple forum accounts is grounds for exile.) 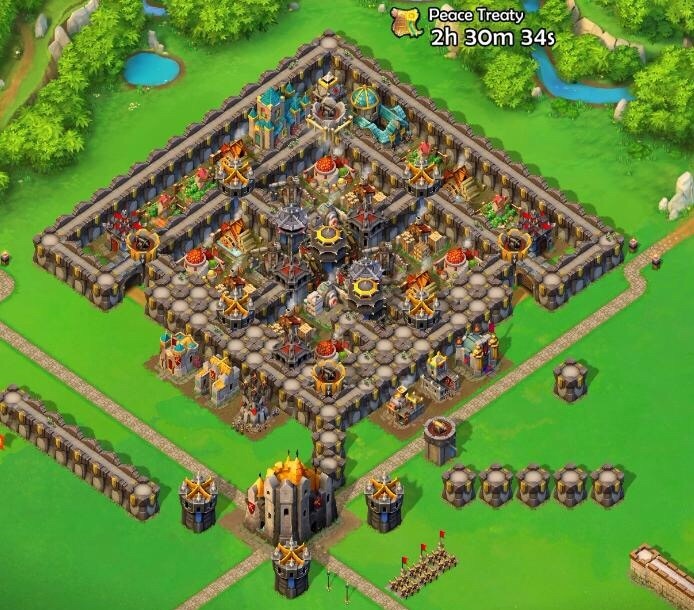 However, the Devs have said that they are aware of various shenanigans made possible by having multiple Castle Siege accounts. The same can be accomplished (albeit with a bit more effort) by any two players agreeing to said shenanigans. They are watching to see how widespread and consequential some of these things are, but any change will be a system-wide change as enforcing unique accounts is as effective as pouring raindrops back into clouds. How do I create multiple castles? 5. go to settings and log off on your old account. 8. After a while, it will create a username for you. Decide to either change that name or keep the name chosen. It may ask for permission which you have to accept. At this point, your new account will be created and you start with the tutorial again. 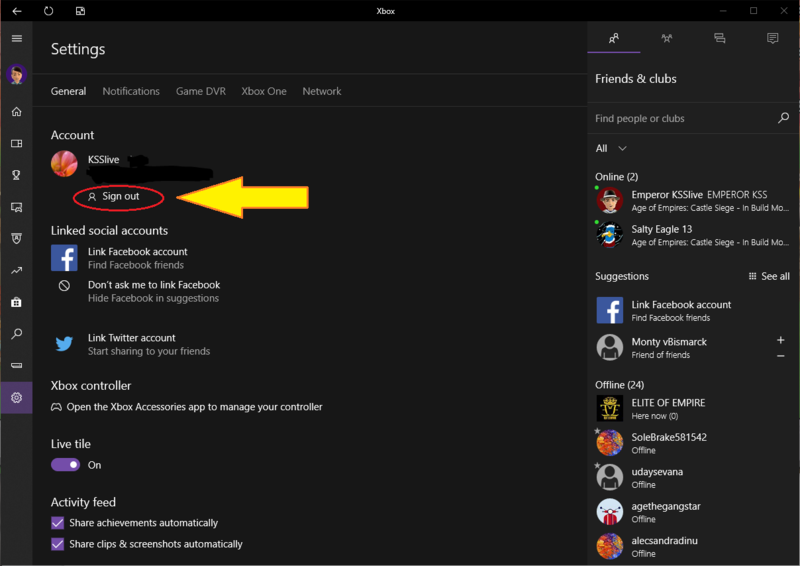 If you want to switch, then log off your new account on the xbox and then when you open castle siege, both accounts will appear and choose which account you want to use. go to Xbox app setting tab and sign out. 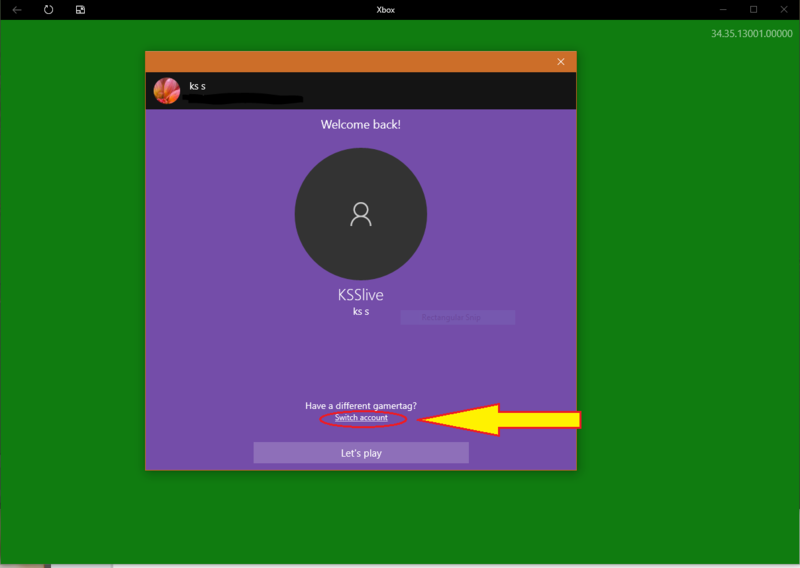 4-Xbox sign-in helper will appear and your default windows account sign-in automatically click "switch account"
5-Xbox account helper will appear choose add Microsoft account (and finish adding by your self) if your account not already in list. 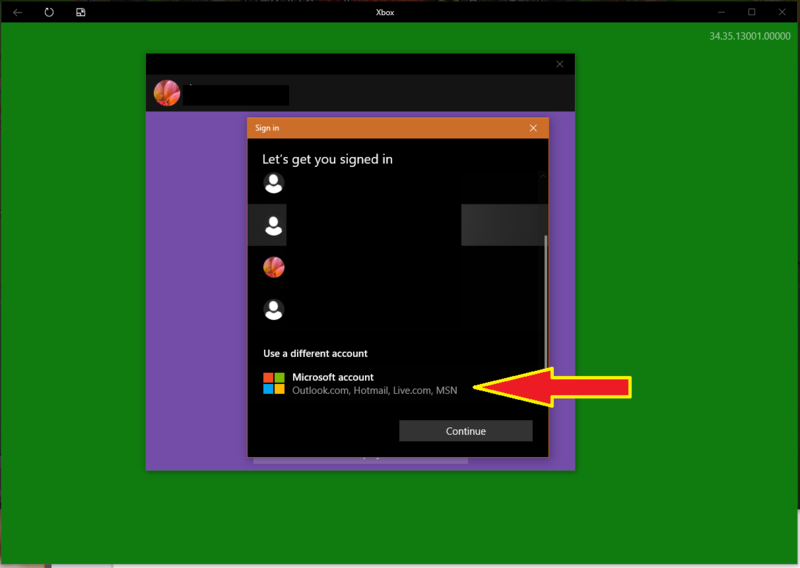 6- once you finish adding Ms account just click and choose that account as seen in above pic. another dialog box re-appear as seen in step 4. if that is your desire account click "lets play " or if not repeat step 5. My bogus justification about how it is legal for me to use an auto-clicker is OK, right? No. You are an idiot. Autoclicking is illegal. If anyone uses an autoclicker, the Devs will reset your castle and/or simply ban you from the game and the forum. "1.9 Are there things I can’t do on the Services? You must not use the Services to harm others or the Services. For example, you must not: [...] Enable unauthorized third party applications to access the Services; [...] Use or attempt to use any unauthorized means to modify, reroute, or gain access to the Services; Use any automated process or service (such as a bot, a spider, periodic caching of information stored by Microsoft, or metasearching) to access or use the Services, or to copy or scrape data from the Services; [...] Fraudulently increase the play count or otherwise manipulate the Services in any way, including using a script and/or otherwise automated process"
The illegality of autoclickers has been confirmed by the Developers many times. "Just a quick reminder to not publicly post the names or Gamertags of users you suspect to be cheating or using methods to stay online indefinitely. Please send a PM with the GT in question to me or another moderator so we can pass it on to the development team for investigation." And again: "As was stated above, it is difficult to believe that someone could knowingly take steps to avoid being attack and not realize they were exploiting the system. Whether you were aware of the consequences of using an exploit does not change the fact that you knew you were cheating." 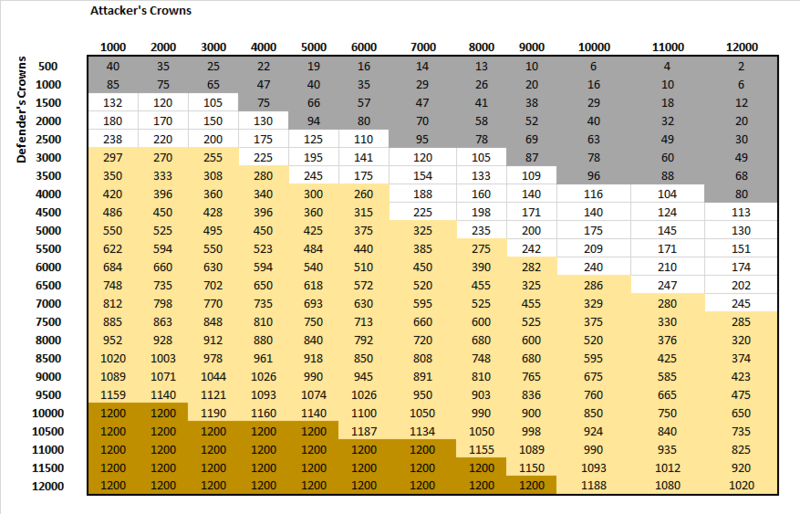 EDIT: I added a crown chart for castles with fewer than 1000 crowns attacking each other. It is certainly not perfectly accurate, but I think it is close enough. EDIT: I added more to the kiting section from TheSilverZealot.